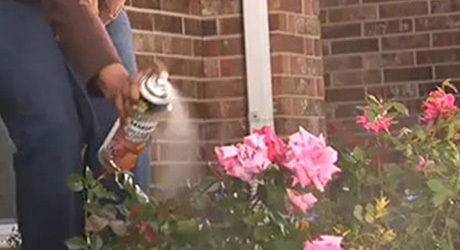 Pruning shapes rose bushes, removes dead wood that could be preventing additional growth, and can help the bushes produce almost twice as many flowers. Pruning hybrid teas and other shrub roses is generally done at the same time as the first fertilization, once the danger of frost has passed. 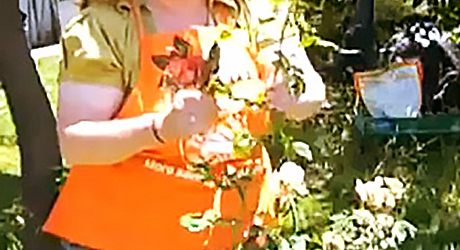 In this guide, the Home Depot Garden Club experts will walk you through how to prune your roses and basic rose care. 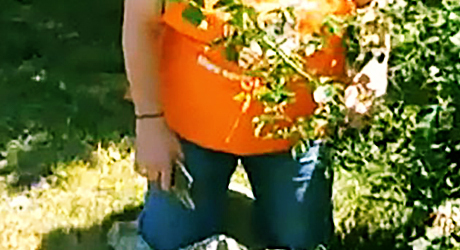 Safety: Always wear thick gloves to protect your hands and arms from thorns while pruning. Pruning may seem tricky, but it’s not. And it’s definitely worth the effort. Pruned roses produce almost twice as many flowers as those that don’t get pruned. Prune less in the beginning. You can always go back and cut more, and most goofs grow back just fine. Since most standard climbing roses bloom on old wood, pruning them in early spring would cut off the blooms, so they must be pruned after they bloom. Dead or unwanted branches can be removed anytime throughout the season. Leave 3 to 5 strong, healthy branches, each 6 to 8 inches long, when pruning hybrid tea roses, and leave 8 to 10 branches when pruning floribundas, each 8 to 12 inches long. Cut at an angle, about ¼-inch above buds facing away from the center of the bush. Shrub roses can be pruned using electric hedge trimmers by simply trimming off about a third of the growth. Prune roses in late winter or very early spring when they have just started to send out new growth in the form of tiny, red buds. Always cut at a 45-degree angle sloping outward from the center to create a fuller rose bush and allow air circulation throughout the plant. Always prune dead wood back to live plant using an anvil pruner or lopper. You will recognize the living plant tissue by its green bark and white-pith core. Start from the bottom of the bush and work your way up. 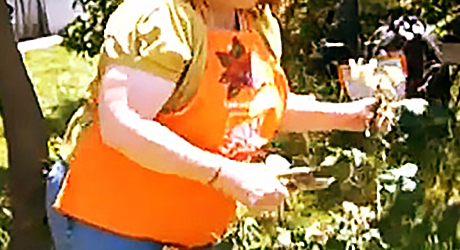 Use long-handled loppers to prune thick canes. Remove any dead, black, shriveled, diseased, or broken wood. Use bypass pruners for canes that are about as big around as a pencil. Remove twigs or branches that cross or rub against each other. Cut off any suckers, the stems that sprout from the roots. You may have to remove some soil to get to them. After you make each cut, cover it with a drop of white glue or prune paint seal to ensure quick recovery, as well as provide protection against cane borers. 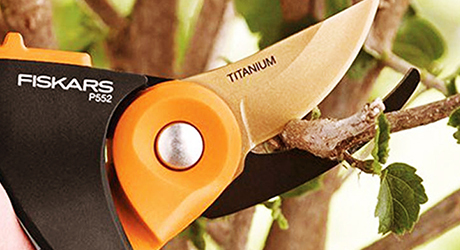 Use a bypass pruner to prune the center of the bush open for maximum air circulation. Cut out some of the living stems that fill up the center. Walk around the plant to ensure that your cuts are balanced and that the bush has a symmetrical shape. 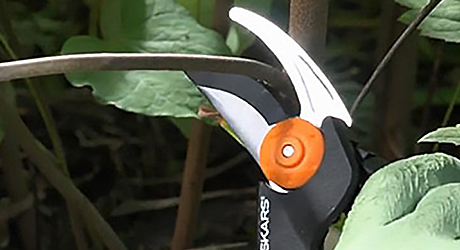 Remove all spindly growth (most canes thinner than a pencil) with a bypass pruner. If suckers stem from the roots that sprout from below the bud union, remove them as close to the main root cane as possible with the bypass pruners. Remove woody old canes using a pruning saw. Saw the old canes off as close to the bud union as possible. Cover the cane end with a drop of white glue or prune paint seal. Use bypass pruners to remove any remaining foliage from the canes and clean up debris from around the bush after you have completed pruning your rose bush. Do not use the material in the compost heap. All roses generally take two years in the garden before really thriving. The same goes for any perennially flowering plant. Roses will respond well to a layer of mulch or pine straw 2 to 3 inches thick spread over their root structure. Roses need plenty of sun. The more the sun they have, the more flowers they produce. Plant them where they’ll receive a minimum of six hours of sunlight a day. Always follow the grower's suggestion regarding how much space your rose will need. If instructions are not available, a good rule of thumb is to provide space that is twice the depth and twice the width of the root structure when planted. Rose roots really don’t like to be cramped, so remember that same rule when planting in containers. All roses, no matter what variety, produce and grow much better with fertilizer. They are very hungry, and do best with standard 10-10-10 formula fertilizers. Remain vigilant with fertilizer application throughout the growing season and you’ll be astounded by the results. Always follow the package’s directions on the amount needed and don't go overboard. Typically, the first fertilization is done shortly after the danger of frost has passed in your region. Check the pH for your soil and add soil amendments if necessary to bring the pH to the ideal range, which is typically around 6.5 for roses. As a general rule, soil that drains easily and has rich nutrients in it will produce better plants. If you’re planting your roses in containers, use quality potting soil and large containers with good drainage. Roses do not do well when their roots are always wet, so do not plant them in areas that consistently get wet or that drain slowly. Water initially upon planting, and then once a week. Roses will respond better to ground watering rather than overhead watering, so soaker hoses are ideal.